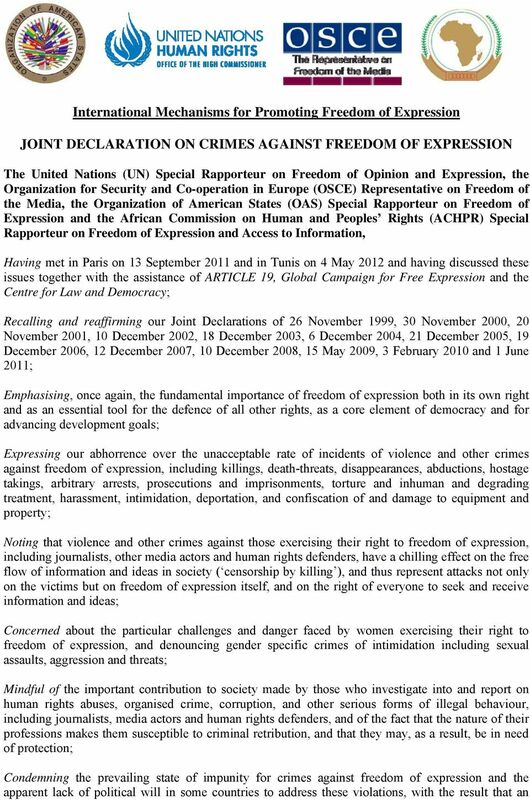 Download "International Mechanisms for Promoting Freedom of Expression JOINT DECLARATION ON CRIMES AGAINST FREEDOM OF EXPRESSION"
3 authorities know or should have known of the existence of a real and immediate risk of such crimes, and not only in cases where those at risk request State protection. b. These obligations include the following legal measures: i. the category of crimes against freedom of expression should be recognised in the criminal law, either explicitly or as an aggravated circumstance leading to heavier penalties for such crimes, taking into account their serious nature; and ii. crimes against freedom of expression, and the crime of obstructing justice in relation to those crimes, should be subject to either unlimited or extended statutes of limitations (i.e. the time beyond which prosecutions are barred). 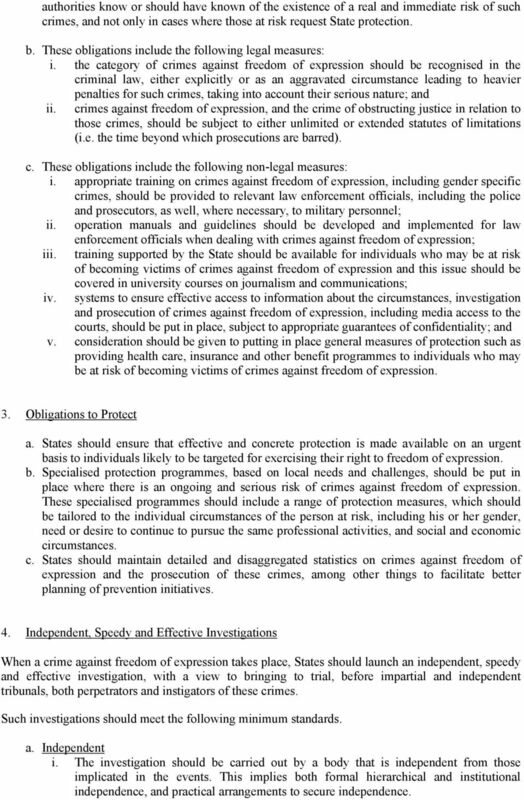 c. These obligations include the following non-legal measures: i. appropriate training on crimes against freedom of expression, including gender specific crimes, should be provided to relevant law enforcement officials, including the police and prosecutors, as well, where necessary, to military personnel; ii. operation manuals and guidelines should be developed and implemented for law enforcement officials when dealing with crimes against freedom of expression; iii. training supported by the State should be available for individuals who may be at risk of becoming victims of crimes against freedom of expression and this issue should be covered in university courses on journalism and communications; iv. 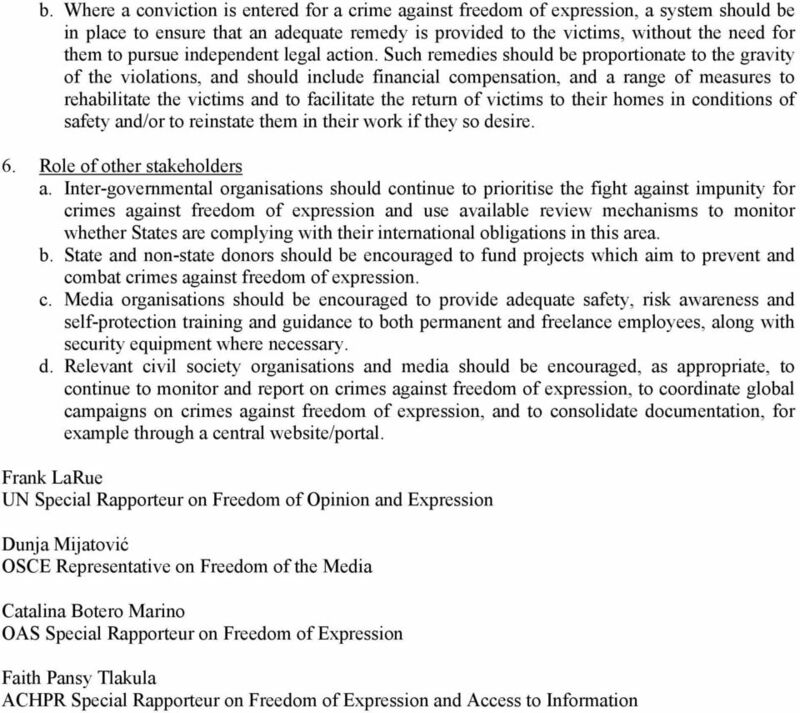 systems to ensure effective access to information about the circumstances, investigation and prosecution of crimes against freedom of expression, including media access to the courts, should be put in place, subject to appropriate guarantees of confidentiality; and v. consideration should be given to putting in place general measures of protection such as providing health care, insurance and other benefit programmes to individuals who may be at risk of becoming victims of crimes against freedom of expression. 3. Obligations to Protect a. States should ensure that effective and concrete protection is made available on an urgent basis to individuals likely to be targeted for exercising their right to freedom of expression. b. Specialised protection programmes, based on local needs and challenges, should be put in place where there is an ongoing and serious risk of crimes against freedom of expression. These specialised programmes should include a range of protection measures, which should be tailored to the individual circumstances of the person at risk, including his or her gender, need or desire to continue to pursue the same professional activities, and social and economic circumstances. 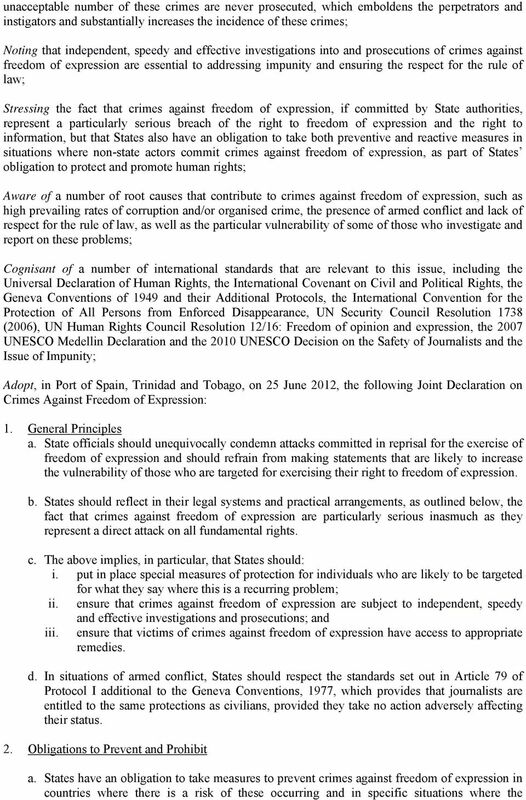 c. States should maintain detailed and disaggregated statistics on crimes against freedom of expression and the prosecution of these crimes, among other things to facilitate better planning of prevention initiatives. 4. Independent, Speedy and Effective Investigations When a crime against freedom of expression takes place, States should launch an independent, speedy and effective investigation, with a view to bringing to trial, before impartial and independent tribunals, both perpetrators and instigators of these crimes. Such investigations should meet the following minimum standards. a. Independent i. The investigation should be carried out by a body that is independent from those implicated in the events. This implies both formal hierarchical and institutional independence, and practical arrangements to secure independence. 4 ii. iii. iv. When there are credible allegations of involvement of State agents, the investigation should be carried out by an authority outside of the jurisdiction or sphere of influence of those authorities, and the investigators should be able to explore all allegations fully. An effective system should be put in place for receiving and processing complaints regarding investigations by law enforcement officials of crimes against freedom of expression, which is sufficiently independent of those officials and their employers, and which operates in a transparent manner. 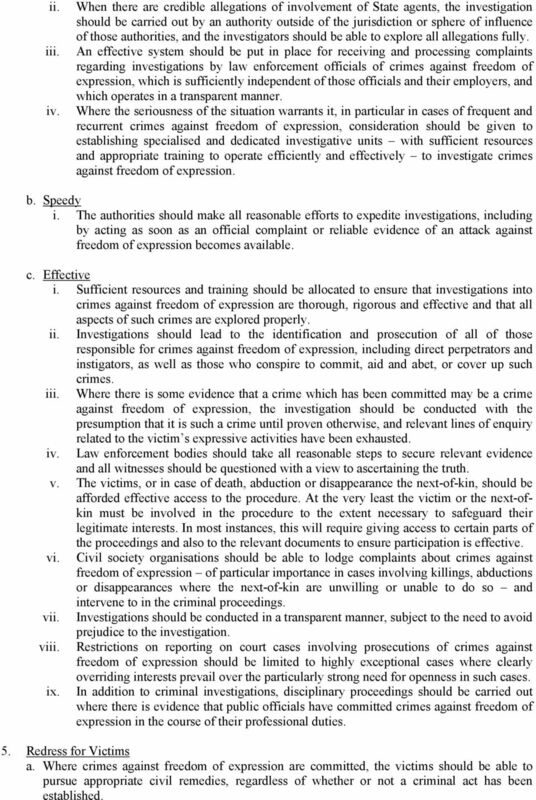 Where the seriousness of the situation warrants it, in particular in cases of frequent and recurrent crimes against freedom of expression, consideration should be given to establishing specialised and dedicated investigative units with sufficient resources and appropriate training to operate efficiently and effectively to investigate crimes against freedom of expression. b. Speedy i. The authorities should make all reasonable efforts to expedite investigations, including by acting as soon as an official complaint or reliable evidence of an attack against freedom of expression becomes available. c. Effective i. Sufficient resources and training should be allocated to ensure that investigations into crimes against freedom of expression are thorough, rigorous and effective and that all aspects of such crimes are explored properly. ii. Investigations should lead to the identification and prosecution of all of those responsible for crimes against freedom of expression, including direct perpetrators and instigators, as well as those who conspire to commit, aid and abet, or cover up such crimes. iii. Where there is some evidence that a crime which has been committed may be a crime against freedom of expression, the investigation should be conducted with the presumption that it is such a crime until proven otherwise, and relevant lines of enquiry related to the victim s expressive activities have been exhausted. iv. Law enforcement bodies should take all reasonable steps to secure relevant evidence and all witnesses should be questioned with a view to ascertaining the truth. v. The victims, or in case of death, abduction or disappearance the next-of-kin, should be afforded effective access to the procedure. At the very least the victim or the next-ofkin must be involved in the procedure to the extent necessary to safeguard their legitimate interests. In most instances, this will require giving access to certain parts of the proceedings and also to the relevant documents to ensure participation is effective. vi. Civil society organisations should be able to lodge complaints about crimes against freedom of expression of particular importance in cases involving killings, abductions or disappearances where the next-of-kin are unwilling or unable to do so and intervene to in the criminal proceedings. vii. Investigations should be conducted in a transparent manner, subject to the need to avoid prejudice to the investigation. viii. Restrictions on reporting on court cases involving prosecutions of crimes against freedom of expression should be limited to highly exceptional cases where clearly overriding interests prevail over the particularly strong need for openness in such cases. ix. In addition to criminal investigations, disciplinary proceedings should be carried out where there is evidence that public officials have committed crimes against freedom of expression in the course of their professional duties. 5. Redress for Victims a. Where crimes against freedom of expression are committed, the victims should be able to pursue appropriate civil remedies, regardless of whether or not a criminal act has been established. Liberty s Briefing: Forced Marriage (Civil Protection) Bill January 2007 1 About Liberty Liberty (The National Council for Civil Liberties) is one of the UK s leading civil liberties and human rights organisations. This work will support the delivery of all other Sustainable Development Goals for children. 37 Nature of Service jurisdiction CIVIL-MILITARY JURISDICTIONAL ISSUES 147. The jurisdiction of Service tribunals for offences under the DFDA derives from the defence power in the Constitution of Australia. Whistleblower Act, 2006 Act 720 ARRANGEMENT OF SECTIONS Section Information the disclosure of which is protected 1. Disclosure of impropriety 2. Person who qualifies to make disclosure of impropriety 3. Regional Anti-Corruption Action Plan for Armenia, Azerbaijan, Georgia, the Kyrgyz Republic, the Russian Federation, Tajikistan and Ukraine. Advance copy of the authentic text. The copy certified by the Secretary-General will be issued at a later time. What is the "Code Of Service Discipline"?